With one of the richest natural heritages in the world, it is a unique experience that delights all adventure loving ones to browse the unexplored paths and preserve natural areas of the desert, the countryside and forests. The most exciting aspect of the visit of a wild animal reserve safari is that it mixes with the unexpected while the expected absent. 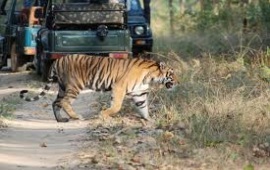 Be it the tigers in Ranthambore, Sariska wildlife or birds in Bharatpur, there is always a reserve to visit and keep full image in the eyes for always. What could be nicer than to be lulled by the "roll" of the approach of a camel when it draws you into the desert to watch the sunset. These hikes can be done over several days through villages scattered here and there while enjoying the rythem of the animal. Like the camel safari, the riding safari is one of the best ways to experience the splendor of Rajasthan during your trip. Over the centuries and dedication and hard work of centuries has resulted in the emergence of very nice breeds India. These horses are known for their endurance and exclusive loyalty to their masters. Walk in the middle of trails through villages, along forts and ancient temples. Nights can be spent in the ancient palaces and forts now property of the descendants of those glorious Rajput leaders. These palaces not only provide modern facilities, but offer cultural programs and various entertainment. The evenings are devoted to local folk dances and music. India is the homeland of the Asian elephant, and Jaipur has a long history of fusion with them. Formerly, they were purchased for the exclusive use of maharajah who in the royal processions, used to sit on a golden seat and / or silver (howda) placed on the back of their favorite elephant. No festival, no ceremony, no religious rite, no marriage would be successful without a row of sumptuously caparisoned elephants. 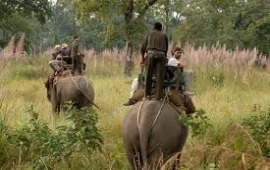 The elephant rides can be arranged in the vicinity of Jaipur, where desert and forests are omnipresent. The beautifully decorated elephant and its Mahout wearing red turban and white cotton jacket await you for a nice ride swaying to the rhythm of the pachyderms. The mahouts are very experienced and know their animal. Each elephant carries two people. 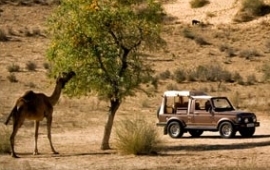 The jeep excursions in the desert of Rajasthan are a quick way to survey the Thar Desert. Not only will you pass by beautiful landscapes but also discover picturesque villages and sometimes completely remote. Some of the most popular routes are passing through Bikaner, Jaisalmer and Jodhpur. It covers about 150 km in the day. Keep in mind that most of the time you will travel on roads outside the box. 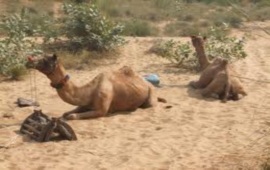 An exciting adventure in India is a bike trip through the desert of Rajasthan. These walks are simply magnificent, extremely pleasant and make you closely observe the local population. 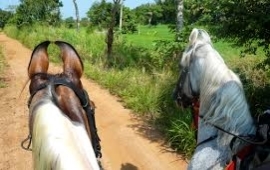 This is an excellent opportunity to explore the countryside. The motorcycle safari, recently introduced, is an adrenaline rush in itself. Just like the bike, it becomes a fascinating experience because it is a real interaction with nature and the inhabitants of rural and mountain areas of Rajasthan. 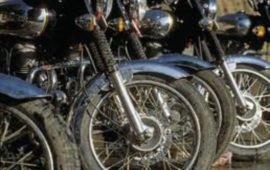 Bikers have the opportunity to close encounters with the locals and can have a deeper understanding of their lifestyle. Motorcycles, via roads and trails, you can discover beautiful landscapes in this beautiful course.